Data can provide a lot of answers. But it also raises a lot of questions. It seems that a lot of marketers are putting data-driven insights over gut reactions and rely on those feelings to answer questions. Lets see some *real data of their point of view. When making an important decision, many of us are tempted to go with our gut feeling. But when it comes to doing business, a decision needs to be backed up by evidence – meaning data. The difference between making a data-driven decision and listening to your gut feeling is the same as the difference between science and science-fiction; one is backed up by evidence and research, the other might sound exciting – but doesn’t really reflect reality. 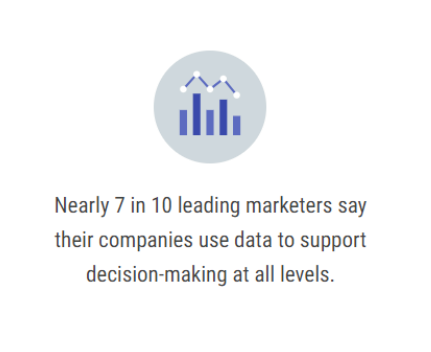 It is interesting that 7 in 10 marketers use data to support decision-making at all levels, which is really logical, but when it comes to data there is no room for gut feelings. We at THEOREMUS come across this reality almost every day. We notice that Bulgarian marketers need data to support not only their decisions but also the strategy of the agency that they back up. However, if the main management underestimate the data, don’t rely on it or don’t understand it, we have noticed that it may continue doing the same thing over and over, when on contrary, the marketing landscape and possibilities nowadays are endless and changing every second. You simply can not segment and target an audience you don’t know, or build a strategy, based on your gut feeling. In summary, when in doubt, forget about your gut feeling. There’s hardly a more powerful source of information than data – so make smart decisions by starting to make data-driven ones. *The research was done by Econsultancy in partnership with Google.